This 115 metre tall office tower is the first step in the urban plan for De Omval, and is in fact only interesting from an urbanistic and technical point of view. 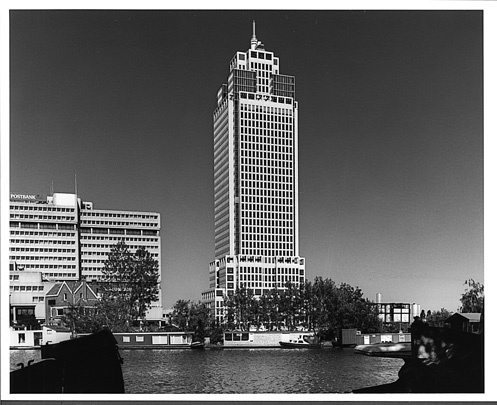 As the tallest building in Amsterdam, it constitutes an about-turn in ideas on high-rise close to the city centre. The design could only be realized once it had been elaborately proved that the tower is sited off all Amsterdam's major sight lines. On the technical front, the important feature is the construction: a burly concrete core surrounded by a steel structure supporting concrete floor slabs with steel-plate reinforcement. It adds a new structural solution to the concrete-dominated world of Dutch high-rise.